What happens when you think about investing? At one side, there is a flash news about how market is doing every minute. A chart or report to look into the other side. ‘Did you know the latest hot investment news?’ a suggestion or an advice or some shocking info from many sides. Isn’t it confusing to know which one to address first or take an action immediately? Not able to cope up well with multitasking, we take some investment decisions wrongly in a hurry and rant at a later point. How can we handle this situation? Read on. It is very important to maintain discipline while making investment choices. Create a method and streamline the processes when you make a decision on new investment model or while researching about a particular product. The best way to start working on a methodology is keeping a workable investing checklist. The great investor Peter Kaufman advices the investors to use an investing checklist in his book “Poor Charlie’s Almanac”. He calls his investing checklist as investing principles checklist. You create your own investing checklist and use it for while making any investment decisions. What is the advantage when you have the investing checklist? Be it investment choices or life decision, most of the times, we struggle because we do not know where to start. Having a detailed investing checklist will save you from this struggle by initiating a process. ‘Investing Checklist’ has more advantages. 1. You achieve a long term investment success. By having an investing checklist, you consider all the key factors like risks, prospects and do a detailed research. 2. Step-by-step investing checklist gives you step-up-step guidance to approach your investment models. 3. You do not miss out any key step that is necessary to lower the risk. For example, with work pressure, we often forget to monitor the performance. We miss out an excellent opportunity to invest more or sell it. But when you have an investing checklist, it reminds you to do it without fail. 4. You always do what you are supposed to do without deviating from the procedure which you have detailed in the investing checklist. 5. You get an opportunity to make changes or modify the decisions on time. Thus you will have an evolving ‘investing checklist’. 6. You get an opportunity to relook the way you have been investing in case of failures or if the investments not performing. You can reconstruct your investing checklist and improvise the investment process based on your experience. 7. Anxiety, tension, stress and other emotional factor rule the way we make decisions. Having an investing checklist helps you to take a right decision without any influence of such emotions. Start building your investing checklist now. 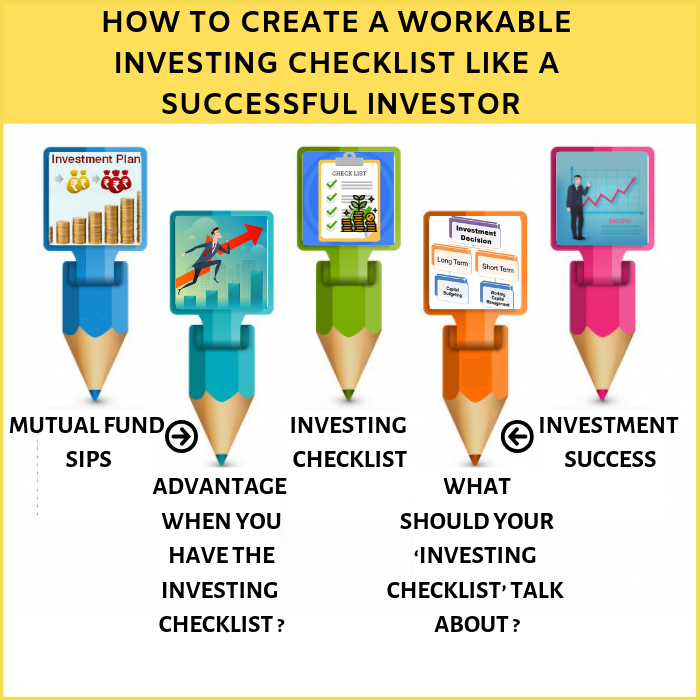 Is there any situation where the ‘Investing Checklist’ do not help much? The ‘Investing checklists’ may not help when you are a starter. You always feel something is missing in the investing checklist which may itself create some panic. Sometimes, you get a false satisfaction of security if you have built your investing checklist based on wrong information about the performance or the market. It may be funny or silly to read, some do not like having an investing checklist as they lose an opportunity to blame the market or other factor if they fail. What should your ‘investing checklist’ talk about? The Investing checklist is not like our grocery list that we create on a particular day? Have you ever worked with the marriage contractors or event managers? They keep a checklist for each occasion an event or a marriage consists. They modify it according to the number of people attending, budget and other factors. Likewise, you must keep an investing checklist while taking different investment decisions. Keep a step-by-step investing checklist for each action that you take while making any investment decision, be it small or big. For example, the checklist for investing in SIPs must have the answers to the following questions. 1. How much money do you have? 2. What is the percentage you want to invest on SIP? 3. Why have you chosen this particular SIP? 4. Have you figured out the period? 5. Will you be able to follow the period as planned? 6. What is the return you will get? 7. Have you got emergency funds? 8. Have you paid off all the debts? 9. If not, what is your plan? 10. How are you planning to monitor the performance? 11. Have you invested in any other SIPs of similar type? 12. If yes, why are you starting a new one? 13. Do you understand the risks associated with your investment? 14. What are your plans to handle high risks? 15. Is the agent reliable, if you are using one? 16. What are the tax implications? Some or all of the above questions can be used while making any investment decisions. Remember, your investing checklist must be simple to do, not a ‘do it yourself’ manual. You become a successful investor when you keep a habit of using an investing checklist. When the investing checklists help to do a research and monitor the performance of your investments, you get to see how the other instruments are working. Due to which you learn a lot. You will be able to figure out the basic characters of a product that can win or lose.